This morning I found another great deal! This time it’s for the Radial Tonebone Loopbone. In a nutshell it’s a true bypass effects loop (dual channel) with boost control. This can give you the ability to have a ‘lead’ effects loop with a hotter signal. 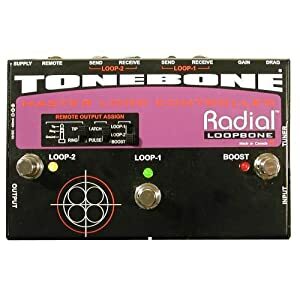 The Radial Tonebone Loopbone lists for $350, and you usually see it in the $220 to $260 range, but is currently on sale for an excellent price of $104.49 at Amazon. This also includes FREE super saver shipping. At the time of this post, there were only 3 in stock. I’m sure when it gets down to 1, the price will increase, so you’ll need to jump on it if you’re interested. The Radial Loopbone Dual Effects Loop is a powerful effects loop controller for pedal boards that allows the guitar player to insert 2 separate pedal effects chains and remove them when not in use. This is particularly advantageous when using older effects pedals that tend to add noise and cause loading problems in the signal chain. The Radial Loopbone incorporates a superb post-effects variable-gain power booster that allows straight signal boosting or post loop-1 or loop-2 boost for soloing.To ensure that the natural tone of the instrument is maintained, the Loopbone features Radial’s unique Drag Control pickup load correction circuit that allows the guitarist to properly match the impedance load of any pedal board configuration with any guitar for optimum performance. Furthermore, there are no signal degrading op-amps or chips in the signal path, only 100% discrete components and Radial’s highly acclaimed Class-A circuit for natural tone and exceptional dynamics.Besides FX-loop switching, load matching, and signal boost, the Loopbone brings even more to your pedal board: a separate “always-on” tuner-out circuit allows on-the-fly tuning without adding noise or load to your instrument signal and, perhaps the most innovative feature of all, Slingshot. Slingshot is Radial’s unique remote switching system that allows the Loopbone to simultaneously switch amplifier channels, other amp features, or even another Slingshot-equipped device. Again, the Radial Tonebone Loopbone is on sale for only $104.49 at Amazon!